Scrapbooking your baby and his first plane ride is a must! This event is most exciting for your little one and the most feared by you! 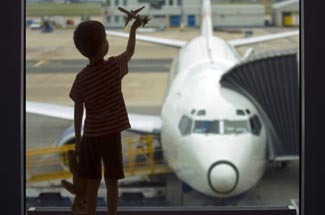 How did your little one do on the airplane? Did he cry or was he so excited? Did he sleep or did he look out the window the entire trip? Be sure to journal your before and after feelings regarding the trip. If your little one can talk, record his favorite part of the trip, too! Did you save your ticket stub? Be sure to include it on the page. Find Other Baby Scrapbook Ideas Here!